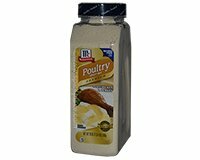 Use McCormick Premium Poultry Gravy Mix for chicken and turkey. Entire bottle makes 1 gallon of prepared poultry gravy. 1/4 cup of Premium Poultry Gravy mix is equivalent to standard McCormick pouch of gravy mix. Bring water to boil. Remove from Heat. Gradually whisk in Premium Poultry Gravy Mix. Whisk for 30 seconds to 1 minute. For thinner gravy, add more boiling water, a little at a time, and mix to desired consistency. White Wine and Herb Gravy: Reduce water to 3/4 cup. Add 1 tbsp white wine, and 1/4 tsp Thyme Leaves (or 1/4 tsp Rosemary Leaves, crushed) into prepared Poultry Gravy. Ingredients: Modified Corn Starch, Corn Maltodextrin, Salt, Yeast Extract, Sunflower Oil, Corn Syrup Solids, Onion, Chicken Fat, Caramel Color, Chicken Broth, Sodium Caseinate (Milk), Natural Flavor, Lactose, Autolyzed Yeast, Disodium Inosinate and Guanylate (Flavor Enhancers), Spice, Soy Lecithin, Sesame Oil. Allergy Information: Contains Milk and Soy ingredients.